Posted on 28, April 2016 by EuropaWire PR Editors | This entry was posted in Aviation & Aerospace, Defence, Italy and tagged Finmeccanica, Italian Air Force Typhoon, NATO vehicles, simulated mission. Bookmark the permalink. 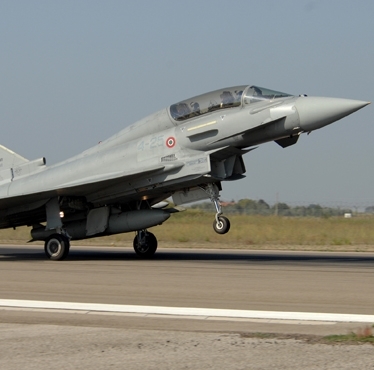 ROME, 28-Apr-2016 — /EuropaWire/ — Finmeccanica, with the Italian Defense General Staff, has demonstrated the successful integration of a Mode 5 Reverse-IFF(Identification Friend-Foe) system, providing air-to-ground IFF capabilities for a Tranche 1 Eurofighter Typhoon. The demonstration was witnessed by representatives from the NATO Battlefield Combat Identification Capability Team. An IFF system provides pilots with the ability to distinguish between ‘friendly’ vehicles and potential threats by sending out an interrogation signal and verifying the responses from other aircraft.. A reverse-IFF system uses the same concept to interrogate ground forces, allowing a pilot to understand where surface-level friendly forces are located before deciding whether to use weaponry. The system is called ‘reverse’ IFF because the aircraft uses its transponder, usually used to reply to interrogations from other aircraft or from the ground, to scan the ground vehicles. To demonstrate the solution, an Italian Air Force Typhoon simulated a Close Air Support mission over Pratica di Mare (Rome) air base in Italy, flying toward and interrogating a number of Italian Army Lince armoured vehicles with its reverse-IFF system. As the Lince vehicles returned ‘friendly’ signals, the Typhoon held off from providing air to ground support that might otherwise have caused collateral damage. to the friendly forces. NATO is considering the Mode 5 Reverse-IFF system as one of the possible short-to-mid-term solutions for air-to-surface identification, to avoid friendly fire when cooperating with coalition forces. The integration solution developed by Finmeccanica has shown that it is possible to introduce such a significant capability in a simple, low-impact fashion using the aircraft’s existing transponder. The integration activities were conducted at the Italian Reparto Sperimentale di Volo National Support Centre EF2000 (IT NSC) within the Experimental Flight Test Centre (Centro Sperimentale di Volo), located at the Pratica di Mare Air Force base near Rome. At the IT NSC, Air Force specialists worked alongside industry engineers, largely from Finmeccanica, to integrate and demonstrate the solution. The demonstration with the Italian Air Force highlights Finmeccanica’s leading role in IFF technology. The latest Mode-5 standard was conceived in the late 90s and developed in the 00s by Italian industry before being adopted by NATO as the new standard for military platforms which will be mandatory across NATO members from around 2020. The Reparto Sperimentale di Volo (RSV) is the flight department of the Experimental Flight Test Centre (Centro Sperimentale di Volo), led by the Italian Air Force. Inside the RSV is the Italian National Support Centre (IT NSC EF2000) based in a sophisticated integration laboratory which includes an avionics integration rig and a software development facility. The IT NSC can support the full development and qualification of avionics modifications carried out at a national level.